2 Our Kids Canada's Camp & Program Guide – 21st Annual Bunk Notes Possible side effects of joining the boarding community at our magnifi cent 100-acre campus in Port Hope may include: earning better grades; gaining greater independence; showing increased interest in actually getting out and doing things; and having more friends. Please don't be alarmed. We have a long track record of motivating boys and girls like yours. 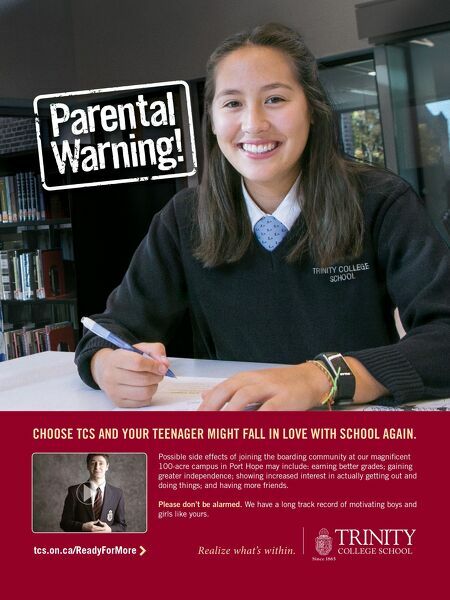 tcs.on.ca/ReadyForMore > CHOOSE TCS AND YOUR TEENAGER MIGHT FALL IN LOVE WITH SCHOOL AGAIN.